Prepare several lengths of pipe cleaner ready for threading. We measured around Pebble's wrist to make sure that they would be just right for making bracelets. Cut up the straws into small pieces. 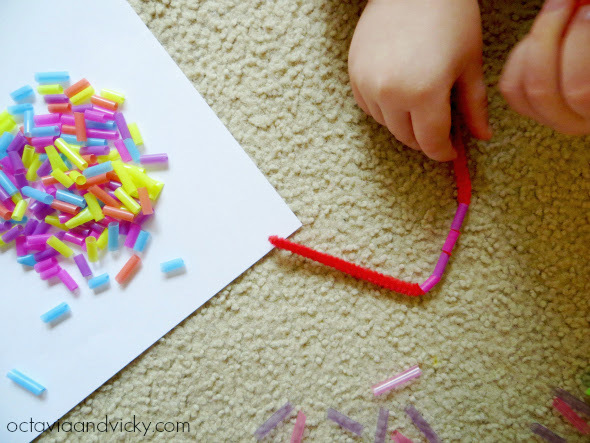 Thread the pieces of straw onto the pipe cleaners. Twist the ends together to create a bracelet. Play with making different types of patterns. Younger children can start by making ABAB patterns (eg. blue, yellow, blue, yellow), while older children may enjoy making more complicated patterns. Cutting and threading are good ways to get some fun fine motor practice. The shorter the pieces of straw, the trickier they are to thread. 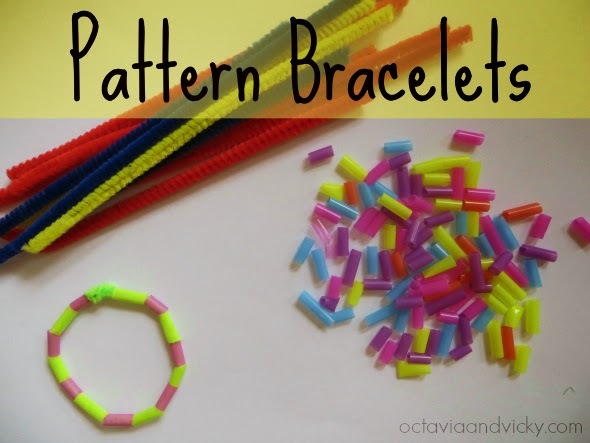 Add some beads to the threading play to make more complicated patterns. Use a tape measure to record the length needed for each pipe cleaner before play. Create pattern necklaces using string. I love pattern bracelet and i really appreciated your posts you to shared on this blog i like these one!i m try do this.